AshleyNewell.me: Happy Birthday Little Courtney! It's been WAY too long since I've done one of my pal Libby's From Courtney's Closet challenges! Courtney is Libby's sweet little girl and every week Libby posts a picture of the cutie pie in an outfit and asks readers to find inspiration from it. I absolutely couldn't resist since last week was Courtney's FIRST birthday! 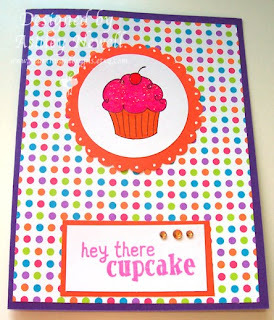 I made this cupcake card based on Courtney's sweet outfit using Unity's Cupcakes A'la Yummy set. This designer paper just screamed happy birthday to me so I decided to use it. A little Stickles, a little bling, and some dots finish it off. Very simple but bright and fun. SUPER cute! Did you piece the cupcake!